Steinkamp Home Center is a family-owned business serving the Dubois County area with quality building materials. Located at 1000 North Main Street (Highway 231) in Huntingburg, Steinkamp's features premium framing lumber, pressure treated lumber and brand name products known throughout the industry. Product lines include drywall and accessories, GAF and Ownes Corning roofing, Tando & Ply-Gem vinyl siding, ThermaTru exterior doors, Andersen windows and Masonite interior doors. Delivery to your home or jobsite is available. Our experienced project sales staff can help you coordinate your choices to maximize the value and appeal of any project - a new deck or a new home! For the interior of your home, Steinkamp's can install carpeting from Shaw, Timeless Designs & Dreamweaver. The flooring department offers a wide variety of products featuring vinyl by Tarkett and Flexitec, ceramic tile by DalTile, MLW Stone, American Olean, Jeffrey Court, laminates by Shaw, Harris, Timeless Designs and hardwood from Beau Floor, Shaw and Harris. Our interior sales staff can help you achieve the look you desire with paint from Porter or Valspar - chosen from our paint deck or color matched from your sample. Illuminate your dreams with light fixtures by Kichler, Craftmade, and Elk. Several styles and finishes are on display for you to select from. 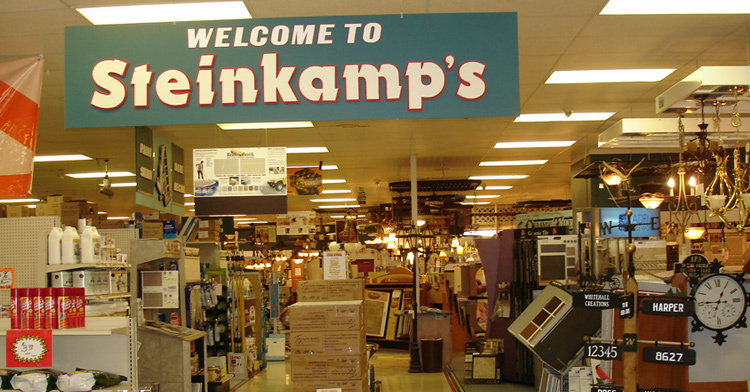 Steinkamp Home Center carries a variety of plumbing and electrical supplies along with hardware and tools for all of your home repairs and 'fix-it' projects. We have recently opened a new location in Ownesboro, Kentucky! One location - two great places for all your DIY projects! The Steinkamp Owensboro Sales Center is your new Project Sales Store and Steiny's Good Stuff is your Close-Out Store at super discount prices! You can find closeout pricing on flooring, doors, hardware, plumbing, building materials and many other discount-priced items! Stop in and check out what we have in store for you!